I've recently come to a realization. My babies aren't babies anymore! Everytime I turn around we're reaching another milestone, and today was one of those days. It was a big day at our house! Josh was baptized and became a member of our church. 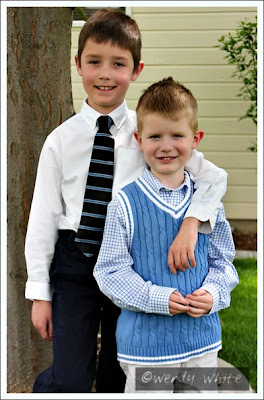 In our religion we wait until children are eight years old to baptize them, and Josh just turned eight earlier this month. We had my mom and stepdad come in from out of town and some friends of our family joined us at the church for the big day. Everything went well and we're really proud of the decision Josh made. So now that all the excitement is over, we're all crashed on the couch, worn out from the day! Here are a few photos of the big day. So baptism excitement pretty much took up our day around here, but the other excitement of this weekend was the National Spelling Bee. Are we the only geeks that actually sit down and watch that every year? We're so geeky that we actually DVR'd it so that we wouldn't miss any of it. I LOVE the national spelling bee! I'm proud of how hard those kids work and it's always exciting to see who wins. This year Josh was mesmerized by it. He's decided that he's going to start practicing for when he's old enough to do it. So look for him in a few years! After my whiny post yesterday you'll be happy to know that my cold is gone, my tooth is feeling somewhat better and my pity party is over. Yay! :) Today I have all sorts of things going on. My mom and stepdad are here so I'm getting Josh off to school, Matthew is going to a friends house for the morning and my mom and I are going shopping! Woohoo! I love shopping with my mom, she should be a professional sale tracker. That woman can smell a bargain from a mile away. Tonight my mom and stepdad are leaving to go play on their boat for a while so I'm planning to put the kids to bed early and cuddle up with Shawn on the couch to watch the finale of Lost that we missed last night. As far as I'm concerned, that's the perfect evening! I really never intended to turn this blog into a "poor me" saga, so I apologize in advance about this whiny post!! I promise to be back to my perky self next week. :) In the meantime you'll just have to bear with me because this is just NOT my favorite week ever. I spent the first half of it sick and drugged out on cold medicine and it's only gone downhill from there. Last week I had a crown done on one of my teeth, and I've still got the temporary crown while they make the real one. A couple of days ago that tooth started to hurt and it's gradually gotten worse. I called the dentists office yesterday and explained to them how it was feeling and she said that it sounds like an occlusion, which means that the temporary crown is too high, so I'm putting pressure and stress on it when I bite down, which is pulling and bruising the ligaments under the tooth. Crap crap crap. It hurts so bad I can barely function. The bad news is that the dentist is out of the office until Monday, so I've got to see if I can find another dentist to see today or I'm stuck with the pain until Monday. I'm really NOT a happy camper. When Shawn came home from work yesterday he reminded me that I had some Vicadin left over from my gallbladder surgery last year, so I took one of those and it actually helped a lot. Aaahhh...but I should have known that the problem wouldn't be that easy to fix!! I tend to have really strong reactions to medication. I have to take child doses of everything or I have crappy side effects. Well in my quest to feel better immediately I took a few regular doses yesterday, which was fine, but then I went to sleep last night and the craziness started. Apparently two of the side effects of Vicadin can be anxiety and fear. That sounds silly, but I'm prone to anxiety anyway and it doesn't take much to put it into overdrive. So I woke up every hour last night in a major panic for no aparent reason. It was the weirdest thing. I would wake up just freaking out about nothing, it would take me a minute to calm myself down and go back to sleep and then I'd wake up an hour later with the same thing. Me and medication just don't get along. And that stinks. So now my options are severe pain, severe anxiety or I can take the anti-anxiety medication that I keep around for moments like this but it makes me really sleepy. On a normal day I would probably just park myself on the couch and deal with it until it passes, but I don't have that option today! Josh is getting baptized on Saturday and it's a really big event for our family. So tonight I have family coming in from out of town to stay with us for the weekend and I have a million things I have to do before they get here. Unfortunately that's seeming fairly impossible right now! I'm currently crashed on the couch in my pajamas having a pity party and trying to figure out how to get through this day. So there's my whiny post for the day. I realize that no one really wants to hear about my pity party, but I do feel better to have gotten it out. I'm going to sit here for a half an hour and feel sorry for myself and then I'm going to drag myself upstairs and get to work. One way or another I've got to get this house whipped into shape by this evening. I'm going to be a much happier camper when this weekend is over, I can get in to see my dentist and I can put this crappy week behind me!! Today I'm feeling somewhat better, my cold has now just turned into an annoying cough. I'm out of my cold medicine induced haze now though, so that's good! So today I'm ready for a fun story. This story gathered quite a following on one of my message boards, so I think it will be fun to share here. Ok, so the first thing you have to know about me is that I LOVE animals. I've always been ridiculously soft hearted when it comes to animals of any sort. I don't even kill bugs in my house, I take them outside and set them free. I walk carefully around ant hills so I don't accidentally step on any of them. I'm really just silly about animals. We don't take our kids to the zoo, they take me to the zoo. And then they have to somehow convince me to leave when it's time to go home. So yeah, I love animals. So since I've become interested in photography it's no surprise that animals have been one of my favorite subjects to shoot. I love nature, I love being outside and I have a lot of patience when it comes to photographing animals. I will sit outside for hours waiting to get the perfect shot. 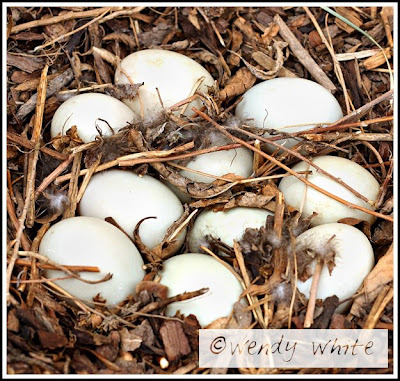 Anyway, earlier this spring I went in to our backyard one day and noticed a few mallard duck eggs in our landscaping. To some people that might be an annoyance, but to me it was the most exciting thing that has happened around here since we decided to adopt! I kept a close eye on the eggs and every day a few more appeared. Eventually there were 10 that I could see. (I later found out that there were actually 12, but I have no idea when the other two appeared because all I was ever able to see were 10.) So of course I got out the camera! The next day I went out there, and the mama bird was sitting on her eggs! This was WAY exciting for me! If there's anything I love more than animals, it's BABY animals! The thought of having baby ducks in my yard thrilled me like nothing else. So being the crazy animal lover that I am, I decided to make friends with the duck. I went to the feed store and bought duck food, I went to Target and bought her a big shallow Tupperware container that I filled with water for her to use as a little swimming pool and I pretty much parked myself in the yard every day to watch her. She wasn't really thrilled with me at first, but as time went on she got used to me. I would go out there every day and refill her food dish and then I would just sit quietly by her for a bit. We had some good conversations. :) Eventually it got to the point where she really didn't mind me at all. She recognized what I was doing when I refilled her food dish every day and she got really excited about that. She was happy to let me sit by her and occasionally would even let me pet her. 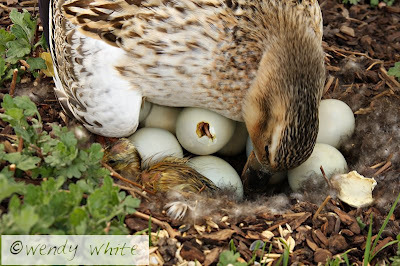 In the meantime I did a lot of research on ducks and duck egg incubation and ducklings. It was my little project for a while! 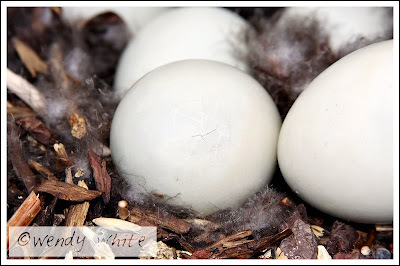 What I found was that duck eggs incubate for 28 days. She started incubating them on April 14th, so by my count they were due to hatch on Mothers Day. Is there anything cuter than that?! So I anxiously anticipated their arrival. In the meantime that mama duck was the most spoiled animal in town. I made sure she was happy and comfortable while she waited for her babies. Mothers Day came...and went. No babies. The next came and there was still nothing happening. After all the anticipation I was really starting to worry that maybe the eggs weren't fertile or that they had died due to the really cold weather we had been having in April. The next day, however, the fun started! 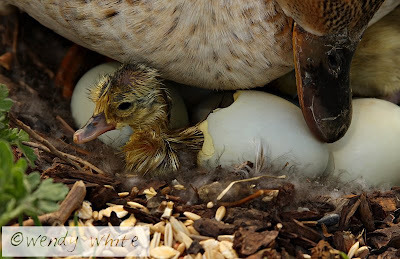 I went out to check on the mama duck in the afternoon and I could see cracks in the eggs! For the rest of that day nothing much happened, and I was afraid when I went to bed that night that they were going to hatch while I was sleeping! The next morning I got up bright and early and thankfully nothing had happened during the night, but by about 8am the babies were starting to make their debut. I got Josh off to school, set Matthew up with every outdoor toy and activity we own and we parked ourselves in the yard for the day. I wish that I had taken a photo of my duckling command center, because it was really pretty humorous. I moved our small patio table over to the side of the house where the ducks were and I set up the umbrella so that I would have shade and also so that the ducks would have shade and I would have even lighting for my photos. I had my laptop out there, my camera and enough snacks for me and Matthew that I wouldn't need to go in the house for anything! I was prepared! 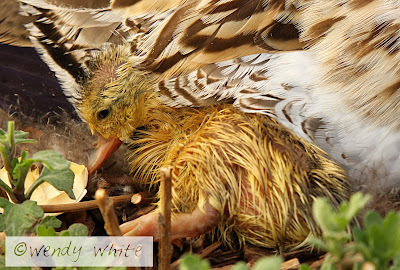 Let me tell you, there is nothing as sweet and interesting as watching ducks hatch. It was really just an amazing thing to watch. They peck all the way around the top of the shell and when they're ready they just kind of pop the shell off and slowly emerge. They come out kind of wet and ugly, but still so sweet. 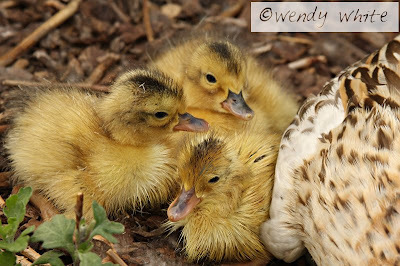 About an hour or so after they hatch they dry off and then they become sweet fuzzy little ducklings. Although there were 12 eggs, by the end of the day only four had hatched, and the rest of them never cracked or anything. I don't know why the rest of them didn't hatch, but the four babies that did hatch were seriously the cutest things in the world! Of course, being the crazy duck lady that I am, I ran out and bought the babies duckling food, and I also filled up a pan with water so that they would have a place to splash around. These ducks were going to have a good life in my yard for as long as they would stick around! We went out each day for the first week and enjoyed watching the babies play. 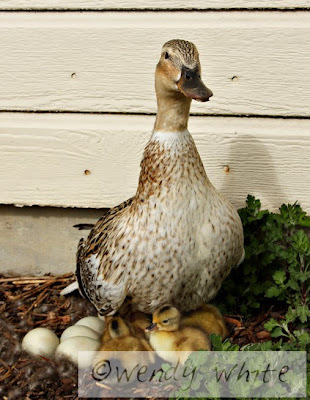 The mama duck was pretty used to me and would stay calm when I was around, but if we had too many people around the babies, she definitely let us know! She was OK for the most part though. We would just sit quietly on the lawn and watch them. 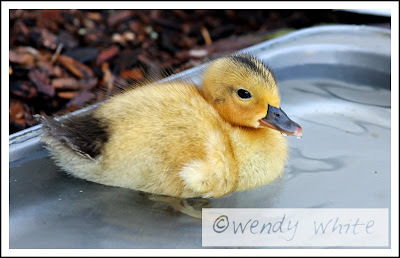 It only took a couple of days for the babies to learn how to swim and then they loved their little pan of water! 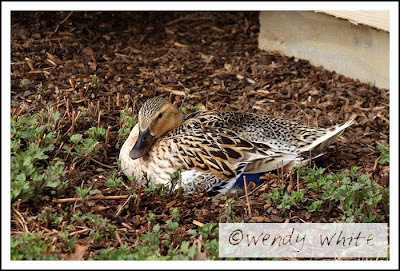 For a few weeks the little duck family played in the yard, took little walks with the mama duck and had a nice life in our yard. Sadly, one day they took their walk and never returned. I don't think that anything bad happened to them, I like to think that the mama decided that it was time to lead her little family to a better source of water. There isn't a pond or anything in our yard, so I knew that eventually they would want to move on, but it was a sad day around here when it actually happened. I miss our little duck family. 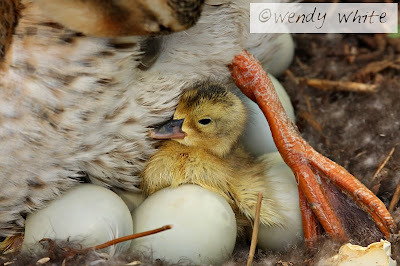 What I did learn is that ducks tend to lay eggs in the same spot every year and babies also will sometimes return to the place they were born. So maybe that means that our duck adventures aren't really over. 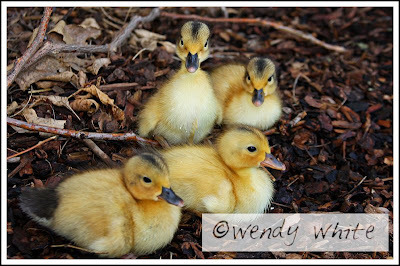 I can't wait until next spring to see if our duck family returns and maybe we'll have more little ducklings hatch in our yard. I hope so!! 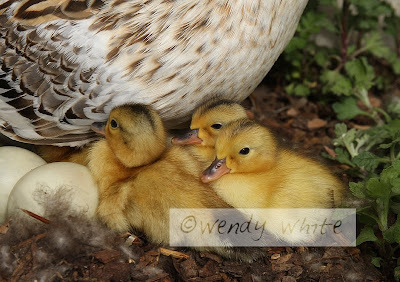 Oh, and by the way, all photos of the ducks, as well as all the other photos on this site, are copyrighted, and if you attempt to steal them or use them in any way I will hunt you down. :) So please don't steal. I do sell my photos and would be more than happy to sell you a print. Contact me for info. What was written here yesterday was a lovely story about my enjoyable adventure at the Department of Homeland Security. I woke up this morning, free of my cold medicine induced haze, and someone informed me that my story could use a few revisions. So let me just say that I LOVE the Department of Homeland Security. :) What a great bunch of men and women. Free pens and all. Our social worker came over last night to do a homestudy update so that we can resubmit our i600a form to the enjoyable Homeland Security office, and let me tell you, what a joy it will be to go back over there. I'm bringing free pens for everyone. 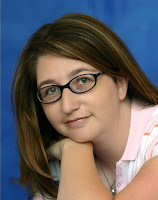 Tomorrow our social worker is coming over to do a homestudy update. I'll explain why tomorrow when I'm a little more lucid. Yep, that's me! I woke up this morning with a nasty cold. Bleh, not the way I wanted to spend a holiday weekend! So today you get random blabbering from me, and if none of it makes sense you can just blame it on the cold medicine. 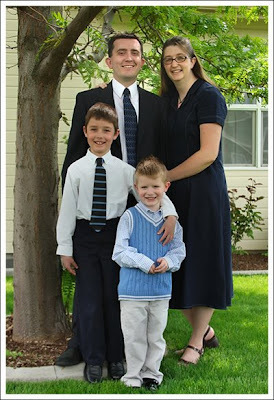 I figured that since I'm just starting this blog that I would introduce you a little more to my family. His name is Shawn, he's 35 and he was also born and raised in Idaho. About 30 miles from where I was raised, in fact. We met at work when we were both answering phones for a company in my hometown. He's my hero and my best friend. We're one of those obnoxious couples who are kind of attached at the hip. If you see one of us, you probably see both of us. We like it that way. 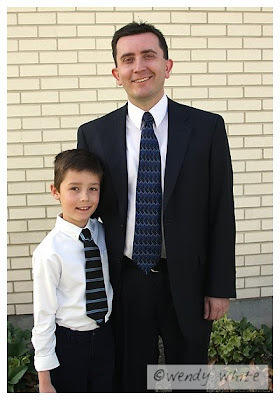 Shawn is a pharmacist who manages an independent retail pharmacy not far from our house. He loves it, he's good at it and I hope that he works there forever. Josh just turned 8 a few weeks ago. My baby is growing up! Josh is our little comedian. He thinks he's on this Earth to make people laugh and he takes his job very seriously! :) He loves to write stories, draw comics, build things with his Lego's and he's our computer whiz! He got a camera for Christmas, so lately he's been taking pictures and video and putting them to music on Windows Movie Maker and they're pretty funny to watch. I don't know what Josh is going to be when he grows up, but I have a feeling that it's going to be something pretty creative. That kid is always coming up with something new! Josh is in the second grade and he loves art, reading and music. He's a sweet kid and we're so blessed to have him in our family. He's extremely soft hearted and is always the first one to cheer people up when they're sad. That's easily my favorite thing about him. He's my little buddy and we love spending time together. We call Matthew our little ball of sunshine. That pretty much perfectly describes him! He's been happy since the day he was born. I think he takes after his dad (thank goodness) and he inherited his easy going genes. Wherever we go and whatever we do, Matthew is just happy to be along for the ride. He makes me happy, it's pretty hard not to be around that kid. Matthew is four and will be five later in the summer. He's really into super heroes these days. He saves us all from the imaginary bad guys several times day, so thank goodness we have him around! :) He also loves books and he loves space and the planets. Ask him and he'll tell you all sorts of facts about each planet. I actually learn a lot from that kid! Matthew just graduated from preschool and is looking forward to starting Kindergarten in the fall. He's excited to get to ride on the big bus with his brother! So now that you know us a little better, I hope you'll check back in with us as we anxiously await the arrival of Clarissa! So it occurs to me that now that I've shared the story of why we've chosen to adopt, that it's really is going to be awhile before I have any other adoption news to report! So I guess in the meantime you'll get random stories and probably some of my photography. Today is a random story day. :) Here's the story of the name we've chosen for our daughter. Let me start out by saying that I'm an advanced planner. Probably too much so in some cases! I don't like surprises in my life, so I try to plan things out way in advance. That generally doesn't work out for me, but it doesn't stop me from trying! So when we got married almost 11 years ago, I started picking out baby names. We weren't even planning on having children for a few years, but it's never too early to start planning these things, right? The name that I thought I loved more than anything was Emily. I decided that whenever it happened, our first daughter would be Emily. Fast forward a few years and I was pregnant with Josh. For the first four months of my pregnancy we called my stomach Emily until an ultrasound informed us that our son probably wouldn't appreciate that name. Three years later I was pregnant again. I'm sure Matthew didn't enjoy being called Emily anymore than Josh did. So here we are, we're having a girl, and I'm finally getting my Emily, right?! Well of course not, I already told you that my advanced planning rarely works out the way I think it's going to! When we first decided that we were adopting a girl, we of course referred to her as Emily for the first little while. Then one day Shawn was going through some papers and came across some family history. We were sitting at the kitchen table and Shawn decided to read me the history of his great-great grandmother Clarissa. For those of you who are interested in the history of the LDS church, you'd probably find it interesting, and for the rest of you maybe not so much. But it's a wonderful story of a really strong, determined woman who went through a lot of trying times and did what she had to do to protect her family and give them a better life. Anyway, Shawn was sitting there reading the history and I was thoroughly enjoying it when suddenly I commented on what a pretty name Clarissa was. WOW-there was the moment. I looked at Shawn and Shawn looked at me and there it was. Our baby's name wasn't Emily, it was Clarissa. Emily is a beautiful name that I love, but there's not any sort of story behind it other than that it's the name I love. Clarissa is the name that I love that has so much wonderful family history behind it. What better way to welcome our adopted child into our family than to give her a family name? So Clarissa it is. We're probably never going to get our Emily, but I'm OK with that. I know that Clarissa is waiting to join our family and I couldn't be more excited to meet her. I've been meaning to start an adoption blog for a while, but I just haven't gotten around to it, and there's not a whole lot to report yet anyway. But today I decided just to jump into it and get going on it. 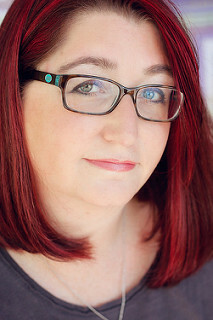 So here's the scoop on me and this blog. My name is Wendy, wife to Shawn and mom of two beautiful biological sons. Josh is 8 and Matthew is 4. About a year ago we decided that it was time to add to our family, but every time I thought about having another child something just didn't seem right about it. I really struggled with what I was supposed to do for a long time. Our family believes in prayer to help us make big decisions in life so I prayed and prayed about it. One morning I woke up and just had an overwhelming need to check into adoption. Not so much a need as a sudden, uncontrollable obsession! It was not something that we had ever really seriously considered, so I tried to shake it off, but just I really felt strongly that for whatever reason, this was the journey that our family was meant to take, and until I did it I couldn't get the thought out of my head! I would wake up every morning and adoption was the first thought in my head and it was in my head all day. I finally had to admit to myself that someone was trying to tell me something and I brought it up to Shawn. Because it literally came out of nowhere it took him a bit to warm up to the idea, but it didn't take long for him to have the same feeling that I did. This is what we were meant to do. So I got to work. I looked into a domestic adoption and for some reason that just didn't feel right. I know so many people who have had wonderful experiences with domestic adoptions, but for some reason every time I researched in that direction, it just didn't feel right. I was in the wrong place. As I did my research I kept coming across these wonderful stories of international adoptions and I was completely captivated by them. That just sounded like such an amazing opportunity to me. Suddenly all the feelings that I had been having just completely clicked into place. That was it. This is what we were meant to do. I started sharing my research with Shawn and we both just really felt so much peace in our hearts that this is what was meant for our family. So we got to work on choosing a country. We were able to knock out several countries immediately because of their travel requirements. Some countries require you to stay in their country for a month or longer and some even require multiple trips. As fun as that sounded, we just can't realistically leave the country for a month. So that left us with a much shorter list. I've always been really interested in Asian culture, so an Asian country sounded great to me. We looked in to China and found really long wait times and we also discovered that I don't qualify because of some medication I'm on. That eventually lead us to Korea. The travel times were perfect for us, we would qualify with no problem, the wait times are on the longer side, but reasonable (about 18 months), and everything about it felt perfect to us. The more I read about it the more I just wanted to hop on a plane and go to Korea that day! This was it for us. So we found an agency and embarked on the long and sometimes frustrating process of putting a home study together. Before I started researching adoption I knew nothing about it and I had no idea what a home study involved. Well I was about to find out! Imagine my surprise when I opened my door one day to find a large package on my doorstep. Inside was a huge binder full of about a million different forms and page after page of requirements and things we had to fill out. When you look at that binder it feels like someone just asked you to climb a very large mountain. I let it sit for a few days but it kept calling at me to get to work, so Shawn and I finally sat down, opened up the first page and went to work. We started climbing that mountain one page at a time. A few months later we had been fingerprinted, background checked, had been declared in good health by our doctor, we had take adoption classes and filled out so many forms that I was seeing them in my sleep at night and we were finally DONE! Nothing felt better than dropping our completed binder off at our home study agency. We had reached the top of the mountain. There's a funny thing about that mountain though. Come to find out we had only climbed a hill. The REAL mountain to climb is the 18 month wait to receive a referral of a child. That's way harder than the paperwork ever was! For months we were obsessed with completing requirements and now that we're done we're ready for the baby! Unfortunately the baby isn't ready for us yet. When we were filling out paperwork and completing the requirements we found ourselves faced with the option to select the gender of our child. Something about that felt really wrong and strange at first. No one asks you what gender what you want when you're pregnant! You get what you get and you love them to pieces. So we really hesitated answering that question for a while. It just felt weird. I was talking to our social worker one day though and she said that because of Korean traditions and society, there are a lot more male children available for adoption than girls, and for the most part if you don't specifically choose a girl you'll more than likely get a boy. So even if you don't choose you're basically choosing. We finally had to admit to ourselves that as long as we were being given the option, we really wanted to opportunity to raise a daughter. We love our boys so much, but this will most likely be our last child and we both would really love the opportunity to raise a girl. So we finally told our social worker to add to our paperwork that we would like a girl. So now we wait for our daughter. We were officially put on the waiting list on November 21, 2007. If the average wait is about 18 months, that means that we can probably expect a referral in the spring of 2009. That's basically a year from right now. Babies in Korea are not referred for an international adoption until they're five months old. So if we get a referral next May or June and the baby is five months old, that means that she will most likely be born around January or February. That means that right now her mother is probably just finding out that she's pregnant. I pray for that mother every day. I can't imagine how scared she must be feeling right now. I wish that I could talk to her and tell her that it's going to be OK. We're going to love her baby with all our hearts and I'm so grateful for the sacrifice that she is going to make. We will most likely never meet her or know who she is, but I will always be grateful to her and she will always be in my prayers. I hope that she feels some peace with her decision. So that's our adoption story right now. We wait and we wait and we wait. I hope that you will check in here occasionally and wait with me. It's seeming pretty far away to me right now! Oh, and I have an explanation about the title of this blog and the photo of the dress that accompanies it. I'm a photographer and a while back I had an idea for a shoot that I wanted to do and I needed a little dress for it. I have not allowed myself to buy anything for the baby because it just seems to early, but as I was standing in Target one day thinking about my photo shoot, I realized that I could use it as the opportunity to buy my daughter her first piece of clothing. So there I was standing in Target and I had a picture in my head of exactly the type of dress I was looking for. I could literally imagine just what I wanted it to look like. Then I looked over...and there it was! If I could literally have drawn a picture of the idea in my head, it would have been that exact dress. It was sitting on rack by itself and it was the only one of it's kind. I went over and grabbed it, and not only was it the only one of it's kind, but it was the exact size that I'll probably need for my baby when she comes home! So I'll spare you the story of the crazy mother trying not to cry over a baby dress in the middle of Target and I'll just say that I bought the dress and brought it home for a photo shoot. I did the shoot that I had in my head, and what it produced was probably the most special and personal photo I've ever taken. 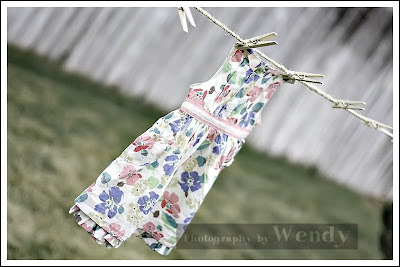 I know that to other people it's just a dress on a clothesline, but to me it signifies something pretty special. My daughter. My heart. Adoption is a really complicated and emotional process. As adoptive parents we really do put our hearts out on the line for these babies. There are frustrations, complications and heartbreaks throughout the process, but what we receive in the end is the baby that was meant for our family, and the baby that completes the space in our hearts. My daughter. I just love the sound of that.